During intense training, don't just "hit the wall" with muscle burn and pain - BLAST through it with Extreme Endurance, a revolutionary athletic performance formula. It's clinically proven to reduce lactic acid by 15% and increase aerobic threshold by double digits. All ingredients are in compliance for IOC, NCAA, NFL, NBA, NHL and MLB. Every single batch of Extreme Endurance is tested for banned substances by the world class sports doping control laboratory, HFL Sport Science. In order to provide re-assurance that the product is suitable for use by elite athletes, the product is approved under the Informed-Sport and Informed-Choice programs. Intramuscular acidosis, is when your muscles have too much excess acid. This condition is caused by the production of H+ (Hydrogen ions) which is part of the energy released from the breakdown of glucose. As your muscles "go acid", this creates fatigue and muscle burn, which you feel during intense exercise. 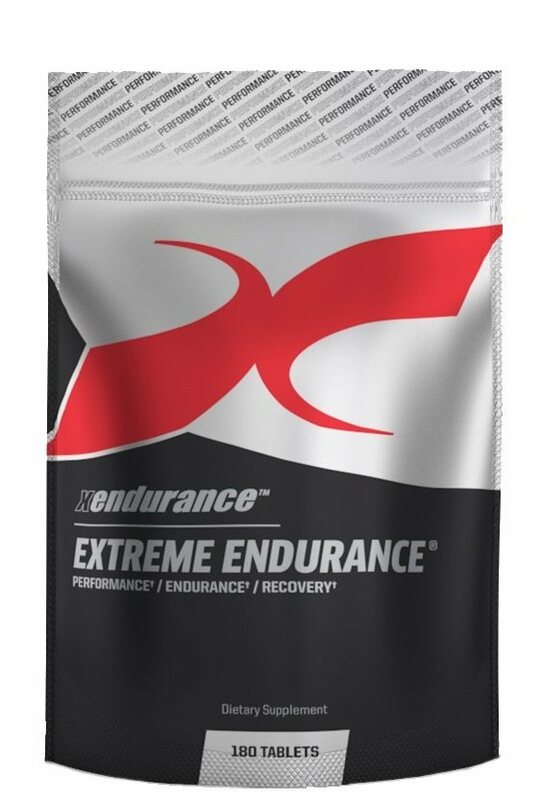 The Extreme Endurance formula and physical chemistry of its 9 ingredients not only assures you that it will buffer production of H+ (Hydrogen ions) and help prevent the acid buildup in your muscles, but it has also been clinically proven to increase aerobic threshold so you can work harder for a longer period of time. Every athlete should know about proper pH balance. PH balance is critical to top athletic performance. PH is measured on a 14 point scale. The lower pH value range, such as stomach acid could average between 1.0 to 3.0. A pH value of 7 is neutral. The arterial blood pH value of a healthy human ranges around 7.35 to 7.45, which is slightly alkaline. As our body uses fuel and metabolizes food, we produce acid waste which is part of the process of energy release from the breakdown of glucose. The body has numerous ways to remove this acid waste or try to neutralize this acid buildup. Our kidneys filter blood and excrete acids through urine. Our lungs release carbon dioxide and we sweat acids out of our skin. We also have built in acid buffers to help neutralize pH imbalances like calcium, hemoglobin and phosphorous to name a few. Your body's acid concentration increases as you produce lactic acid. Lactic acid is split into Lactate (Lactate ions) and Hydrogen ions. H+ (Hydrogen ions) is the acid in Lactic acid. Lactate is good and is an extremely fast fuel that is preferred by the heart and muscles during exercise. Lactate is vital for ensuring that your body gets a steady supply of carbohydrates. H+ (Hydrogen ions), the other half of Lactic Acid is not good, especially when the acid concentration exceeds the body's ability to no longer neutralize or flush the waste from your body. A Gold-Standard, *third party, double-blind, placebo controlled, cross over study, was conducted on Extreme Endurance whereby twenty-two (22) elite athletes were given baseline tests. Each athlete was given dosage protocol and either product A or product B. When the final test results were completed, the 22 athletes showed an average lactic acid reduction of 15% and an increase of aerobic threshold by double digits. All athletes reported less muscle burn and faster recovery with less muscle soreness. This clinical study was published in the Clinical Journal of the European Society for Clinical Nutrition and Metabolism, (vol 5, supplement 1, 2010) and presented at the March 13, 2010, 6th Annual Conference of the EU Nutraceutical Association. - And our testing continues on athletes at Corpus Diagnostik in Hilpoltstein, Germany. Jürgen Sessner, the lead researcher at Corpus Diagnostik has done over 8,000 Step Tests, (we call them VO2 Max tests in the US) in the last decade and has been testing athletes for 13 years including 3 Hawaii Ironman Champions. He has held over 70 training camps for triathletes and cyclists in the EU and Canary Islands. Cross-Functional exercise, defined as “constantly varied, high intensity, functional movement,” has revolutionized the sport of fitness in an attempt to seek out the world’s fittest individuals. Within the generalized programming that Cross-Functional athletes use, there are a series of “Benchmark Workouts” designed to help measure the progress of a cross-functional athlete’s development. Among these workouts is ‘Fran,’ quite possibly one of the most well-known and frequently tested benchmark workouts among cross functional athletes. Fran is a couplet that exercises a 21-15-9 repetition scheme of front squat thrusters (95lbs for men, 65lbs for women) and pull-ups. Due to the metabolic efficiencies needed to complete ‘Fran,’ and the physiological responses that it elicits, Xendurance chose to highlight this workout and put their showcase product, Extreme Endurance, to the test again. In September of 2013, Jürgen Sessner, lead researcher at Corpus Diagnostics in Hilpoltstein, Germany, flew out to conduct the test. Jürgen has conducted over 8000 stress tests in his 15-year career and was the lead researcher on the clinical study that was presented at the prestigious European Nutraceutical Association meeting in Vienna, Austria, March 13, 2010 and is published in the European Nutraceutical Jourrnal. In the open label test conducted at East Valley Crossfit in Chandler, AZ, 11 cross-functional athletes, ages ranging from 22-66 were randomly selected. All athletes met the minimum criteria of at least 10 months of training leading up to the study and were required to complete ‘Fran’ twice over the course of a 7-day period. Upon being selected for the study, all of the athletes took part in a two-week washout period from all supplements. On day one of the study, a baseline ‘Fran’ test and blood samples were taken. Athletes were then provided with a 7-day trial of Extreme Endurance and were instructed to take 3 tablets in the morning and 3 tablets in the evening, with or without food. At both the baseline and post supplementation test, athletes had blood taken from the earlobe immediately before, after, and 10 minutes after completing ‘Fran’. All ‘Fran’ times and movement standards were validated by a judge for each of the participating athletes. After further analysis, the single best and worst performances were omitted from the study to ensure more accurate results. Of the remaining 9 athletes, a 7-day supplementation of Extreme Endurance yielded an average of 6.2% or 22-second improvement on their respective ‘Fran’ times. All blood samples were analyzed by a Hitaldo Super, GL Biosensor System. Blood tests after a 1-week usage of Extreme Endurance reduced lactate levels by 8.9% immediately post workout and 7.1% 10 minutes post workout when compared to blood samples taken at baseline. As reported by the national media*, Rhabdomyolosis (Rhabdo) is an increasingly, alarming topic among the cross functional community, the military warfighters and firefighters. While this topic is not new to the military warfighters and firefighters, it is taking the cross functional community by surprise. Unlike the day-to-day occupational hazards the military warfighters and firefighters face, this unique style of training has many cross functional athletes discussing the possible repercussions that come with it, namely Rhabdo. Given the growth of the sport and the continued scrutiny that comes with the sport, this disease now has it's own mascot, Rhabdo the Clown. Rhabdo is a dangerous medical condition often associated with strenuous exercise and overuse, infections, crush injuries, elevated or reduced sodium levels, low potassium, unusually high or low body temperature, particular medications, and dehydration (or a combination of factors). And up until now, military warfighters and firefighters were the only groups worried about Rhabdo. We can now add the cross functional athletes to the list impacted by this medical condition. The breakdown of muscle tissue results in damaged cells entering the blood stream. Myoglobin, a toxic protein released by these cells, is harmful to the kidneys when released in large quantities and can lead to permanent kidney damage, or even kidney failure. Rhabdo is often diagnosed by measuring an enzyme released into the blood by damaged muscle tissue, creatine kinase (CK). It is not abnormal to see CK levels rise above 100,000 U/I in Rhabdo cases. With the growth of these communities, Xendurance set out to prove that Rhabomyolysis (muscle trauma) can be averted. Their scientific study, completed in January 2014 by Jürgen Sessner , showed astonishing results with usage of the sports supplement, Extreme Endurance and the reduction of CK levels, the precursor for Rhabdomyolysis. a 2-week washout period. All the athletes were required to perform “Fran” twice over the course of an 8-day period. On the first test day, athletes completed “Fran”. “Fran” is one of the best known workouts among cross functional athletes. Fran is a back-to-back exercise of a 21-15-9 repetition scheme of front squats thrusters and pull-ups. Due to the metabolic efficiencies needed to complete “Fran” and the physiological response that it elicits, Xendurance once again chose this epic workout for this CK study. After completing the first “Fran” workout, each athlete received their 7-day trial of Extreme Endurance. They were instructed to take a dosage of 3 tablets in the morning, and 3 in the evening, while keeping their current diet and training schedule unchanged. On day 8, the participants returned to complete the second test. On each testing day, CK levels were tested via blood taken from the index finger and analyzed by a Reflotron Plus System (37°C) immediately pre and post “Fran”. To place Fran in perspective, the increased CK levels associated with Fran could be equivalent to the CK levels a firefighter may experience on the front lines fighting a fire or a Military Warfighter on a 10 mile trek with full equipment. All three events have the ability to increase your CK level. Upon analysis of the data, the results showed that after a 7-day supplementation period on Extreme Endurance, a decrease by an average of 16.9% (33.1 U/I) in CK levels pre-workout and a 63.55% (32.6 U/I) decrease in CK levels after completing Fran were recorded. In addition, none of the athletes who participated recorded CK levels that would indicate the onset of Rhabdo. 29 of 31 athletes performed better in the second workout with an average of 8.55% or 32 seconds faster. A clearly recognizable lowering of beginning CK levels were evident before the second workout. As noted, the results showed a lower entry of 16.9% or 33.1 U/I. After completing the second workout, the data showed additional reduction of CK levels of 63.55% or 32.6 U/I (total 79.64%) While 29 of 31 athletes performed better in the second workout with an average of 8.55% or 32 seconds faster, all 31 athletes reported a quicker recovery. By looking at the results from this open label test, it can be concluded that Extreme Endurance is affective in decreasing muscle trauma and decreasing recovery time as indicated by lower CK levels. This means less cell damage, safer training, and a quicker recovery and allows more training load in both short and long term. Extreme Endurance is tested by the largest sports lab in the world. HFL is located in the UK and its testing of Extreme Endurance is done using gaschromatography with mass spectrometric detection (GCMS) and liquid chromatography with mass spectrometric detection (LCMS). In layman’s terms, - if you put one drop of a banned substance in an olympic size swimming pool, this testing would find it. It is costly, but we have many pros who can not afford to have their tests come up positive. HFL's newest testing programs for athletes are called Informed Choice (US) and Informed Sports (EU). To summarize, there is not another product in the world that has a Gold-Standard, third party, clinical study, that has been published, and has been tested drug-free. Taking XECUTE 70-90 minutes before exercise allows the lactic blood concentration to rise. This allows muscles to utilize lactate as an energy fuel earlier and helps raise the lactic threshold. By using lactate as a fuel energy source, the blood plasma becomes more alkalizing and helps the body lower its acid pH, thereby raising the lactic acid threshold, which translates into less muscle burn and less muscle soreness.